The Internet is a democratizing medium that gives ordinary people the power to be content creators and information disseminators. This point has been discussed to death on the vessels of that change – blogs and social media (journalists love nothing more than talking about journalism). On the flip-side of this, the Internet takes away power from people who do not create and do not create a virtual presence for themselves. If you can’t find someone or something on Google, it might as well not exist. Therefore, entrepreneurs have found ways to give the power of content creation to as many people as possible, and have been rewarded handsomely. It’s easy to see that this is true; content creation and publication has become progressively more accessible. Blogs were the first major source of user generated content – but in order to have one, you had to be able to actually write (if only that were still true). MySpace, Facebook, and Twitter made it even easier to be a content creator – you no longer needed to be able to write, you could instead type a few words in a status update or a wall post, or tweet about your morning breakfast and be heard by potentially millions. Now you can just take a photo of your morning breakfast and share it on Instagram, or simply click a like button and share your preference for eating your eggs with ketchup instantly. However, the content creation renaissance is over and now getting you to share more is serious business worth billions of dollars per year. More sharing is more content to serve ads over. More content to serve ads over is more money. In the new world that Facebook and others are leading us into, to create content you need not do anything at all. Listen to a dubstep remix on Spotify, share a story; read a crummy article about hot summer styles on Yahoo, share a story; watch a YouTube video on Socialcam, share a story. We are rapidly losing the power to choose what we share and with whom. What’s more is that because to be searchable and indexed on Google is to be, we are in need of exposing our lives more and more on public channels to permanently plant ourselves in the memory of the Internet. Nobody wants to be forgotten. We are losing control over our content as well as how we are represented online. That power is entirely in the hands of social media and search companies. As a computer scientist, my biggest fear is that the gigantic brain of the Internet will be used to abuse people who have the least power – those who have had their lives shared in public and can’t get it back. I fear that companies and governments will make dangerous assumptions about you with your public data. I fear that health insurance companies will automatically raise my rates because I let my friends know I was traveling to a malarial area. I fear that auto insurance companies will raise the rates of people who say they are “doin’ 105 on 105” without realizing it’s a lyric from Kendrick Lamar. I fear that companies will reject people from jobs by algorithmically turning down candidates with lower perceived reading levels. And there are already plenty of known examples of governments data-mining to discover political dissidents. I think we can fix our algorithmically determined future by doing a couple of things. The first is obvious – we need better privacy settings, and ethical default sharing options. Anyone that has built an app knows that users largely use whatever the default provided to them is. Private is an ethical default. Public is not. When new users sign up on Facebook right now (try it), their default sharing option is public, and that is wrong. The second is that search engines, social networks, and other data stores need to provide ways for users to easily remove, hide, or at least curate their personal data that’s been cached or stored permanently. Some sites, such as deviantART, will not remove comments you have posted. That’s wrong. The third is that companies that provide sharing options and have the brain power to do so should create algorithms similar to spam filters that can identify and assist users sharing content publicly that may hurt them. I say this because if they don’t, then all of the entities above will, like insurance companies, banks, law enforcement, and governments, and that will be bad for these companies in the long run. If users lose their trust with a service, they will go find a different one. We can still fix this. It’s going to take education and some or all of the ideas I have mentioned. If you are reading this right now, you are somebody that can make a difference. Set your privacy settings on all of your apps and show your friends and family how to do the same. Demand better privacy policies from companies that store your data. Before sharing something, think twice about whether you want that information to be searchable 20 years from now. I am hopeful that as an industry, together we can take back control of our future. 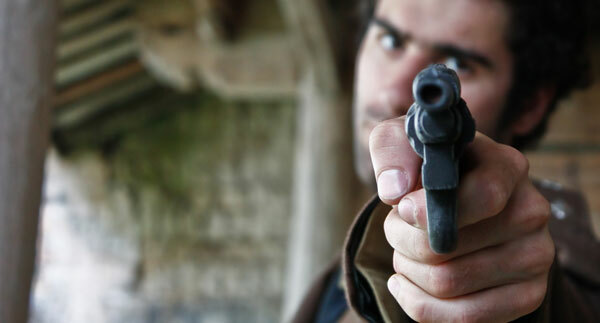 Man pointing gun photo from Shutterstock.